Phanteks showed off a pair of interesting slim aluminium fin-stack CPU coolers, the PH-TC14S and PH-TC14LS (pictured in that order below). 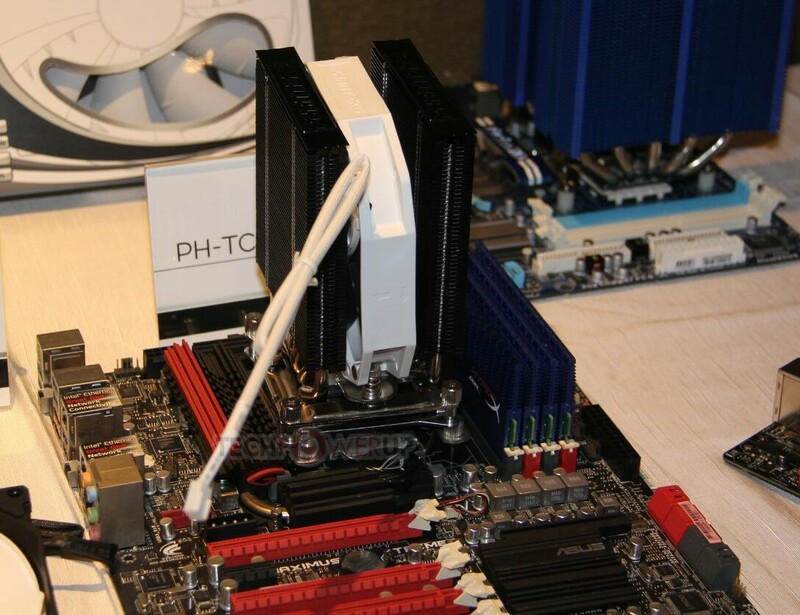 The PH-TC14S is a unique D-type heatsink, built using two slim black aluminium fin stacks, with the cooler's only fan, a F140HP-PWM, being nestled between the two stacks. The PH-TC14LS, on the other hand, is a compact C-type heatsink, with one slim aluminium fin-stack, and the same F140HP-PWM fan. This fan can take PWM control, and spins between 600 and 1,300 RPM, pushing up to 88.6 CFM of air. why would they show it off with a mini itx board when it covers both of the ram slots? or does it just look that way because of a shadow from the flash? I think it's just a poor angle for the photo. Here it is from another angle. It looks like it may interfere with tall heatsinks in the slot closest to the socket but there should definitely be enough room for normal-height DIMMs. Just stick with AIO watercoolers. Superior performance with a low profile water block.